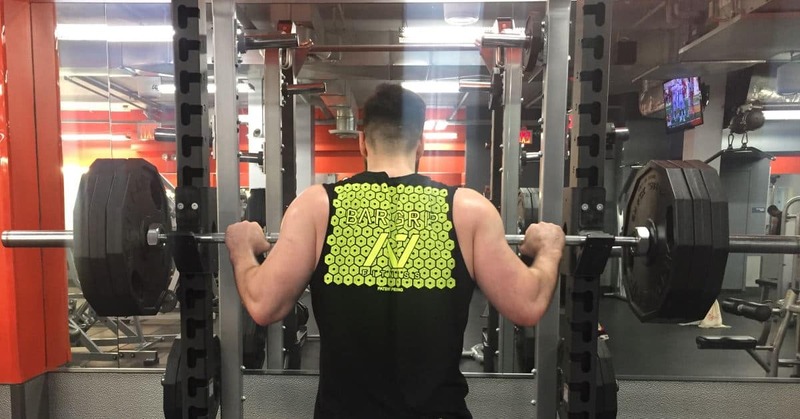 If you're looking for a detailed review of the A7 Bar Grip muscle tee shirt, then look no further! I'll tell you everything you need to know about this game-changing training tool that just so happens to double as a nice-fitting piece of gymwear. 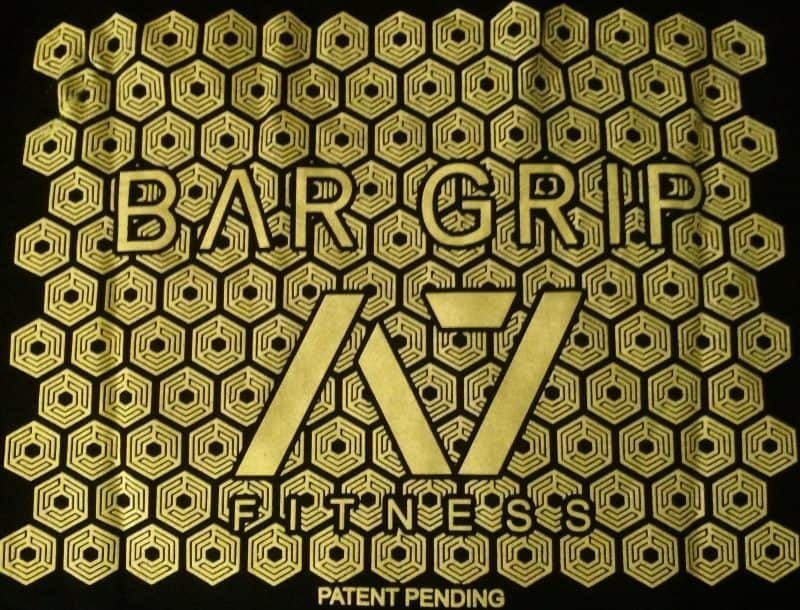 ...However, now they are just calling the "Bar Grip" shirts again (i.e. they dropped the "Full" from the name) since all of the Bar Grip shirts have this feature by default now and going forward. This page that you're currently reading now is about the muscle tee style of the now-outdated Bar Grip 3.0 line. The new muscle tees are not always available. Usually, they make a comeback around the summer season. The new Bar Grip muscle tees, when they are available, are made of a stretchier material than the 3.0 muscle tee's material that I describe later on this page. The new material gives it a tighter fit and better moisture wicking ability. I recommend reading my A7 Bar Grip Full shirt review to learn about all the other differences with the new and improved Bar Grip shirts vs. the old 3.0's. 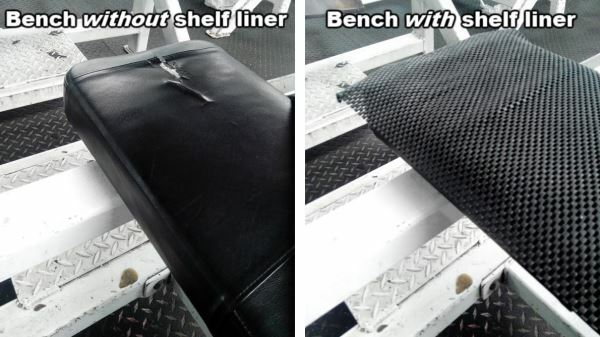 Never Get Caught Slipping Again...on Bench or Squat! Where to Buy the A7 Fitness Muscle Tee? 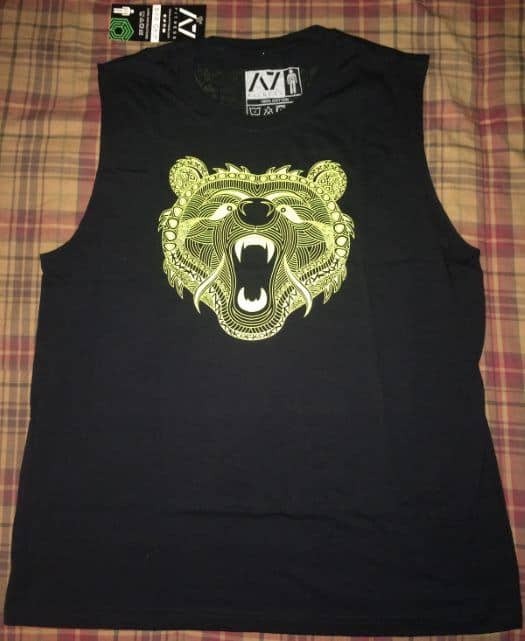 Although this review features the "Gnarly Bear" muscle tee design, you should know that there are other design variations available. Everything in this review holds true for all A7 Bar Grip muscle tee design variations (besides the image on the front and the colors, obviously). I'll talk about the benefits of this muscle tee, including how it can improve your bench and squat. I'll also go over the considerations you should make before buying it. Plus, I'll discuss its pros and cons, features, important specs like sizing, and alternatives. 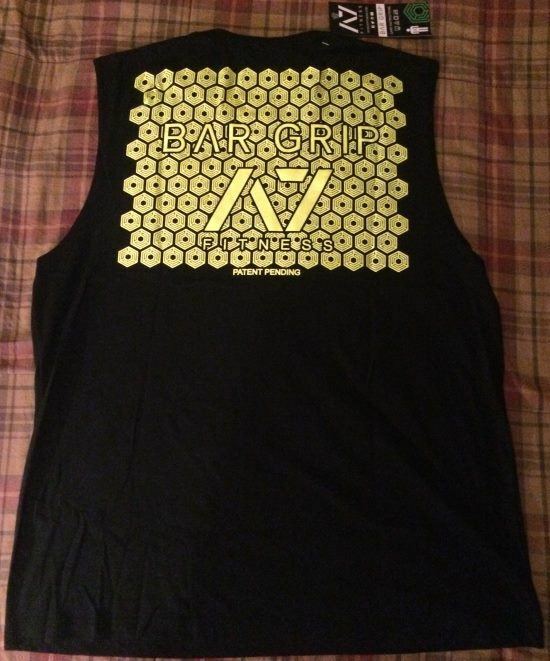 Before I start this muscle tee review, I want to point out that I've already done a A7 Bar Grip shirt review. This previous review was for A7's flagship t-shirt. The shirt I'm reviewing in this post is for their muscle tee. Both shirts carry out the same basic function. However, there are some other small but important differences, which I'll discuss in this review. 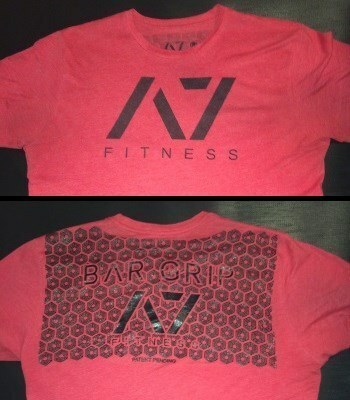 The A7 Bar Grip Muscle Tee: This is my newer shirt and it's the one I'm reviewing in this article. The A7 Bar Grip 3.0 T-Shirt: This was my first A7 Fitness shirt, which I already reviewed. Are you tired of sliding ﻿﻿﻿during bench press because your back is too damn sweaty or the fabric on the bench is smoother than butter? And what about squats? Does the bar slide down your traps because the center bar knurling looks like it's been eroded to nothingness by a power sander. If you are struggling with either or both of these problems, then the A7 Bar Grip Gnarly Bear Muscle Tee Shirt may be the solution you are looking for. I bought my first A7 Bar Grip shirt because ​of the former issue. Bench press was more like a water park ride than an exercise, thanks to my knack for sweating profusely during training. Of course, I had tried other solutions to prevent my back from slipping during bench, which I've written about in this ﻿﻿article. ​I tried chalk, but that can be messy and you have to constantly reapply it. Even then, it wipes right away if your sweating hard enough. Plus, some gyms don't allow it. I also tried securing a drawer/shelf liner to the bench with resistance bands. This worked pretty well, actually. But it wasn't the perfect solution. The liner would bunch up or shift during some of the heavier and sweatier sets. Ignoring that, it was just a hassle to put on, take off and adjust--and it took up valuable space in my gym bag. After buying the first shirt and putting it to use, I immediately realized I had found the perfect solution! It quickly became my favorite item of gym apparel--and one of my favorite gym-related items, period. ...I can confidently say that this muscle tee​ is just as effective and elegant a solution to my bench press problem as my original A7 Bar Grip t-shirt. 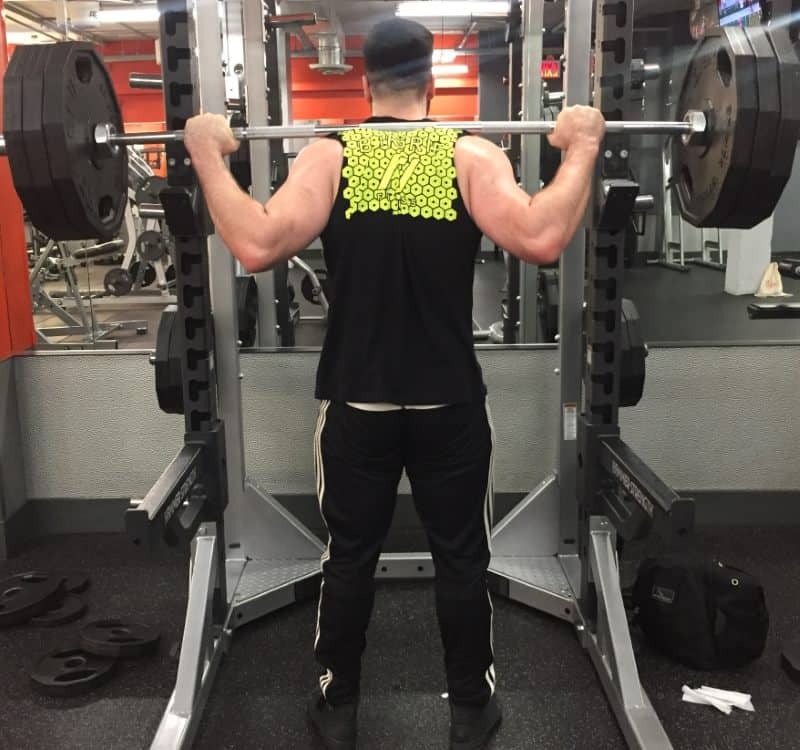 Do you actually have an issue keeping your back/shoulders in place during bench press? Or keeping the bar in place on squats? 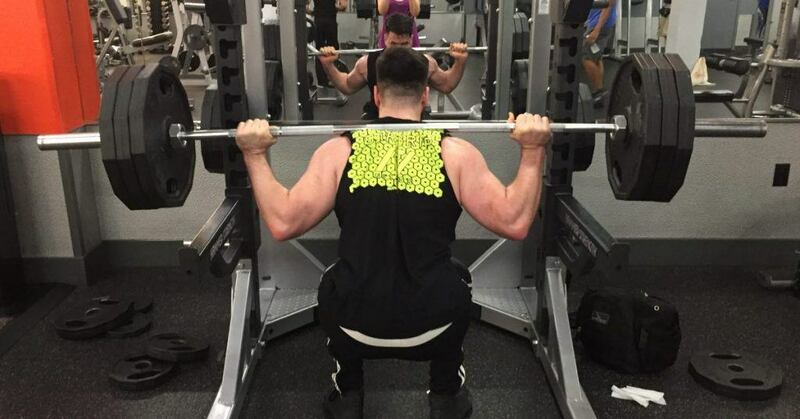 If you don't have these issues, then there's really no need for any Bar Grip shirts--unless you just want a nice-fitting gym shirt with a unique design. 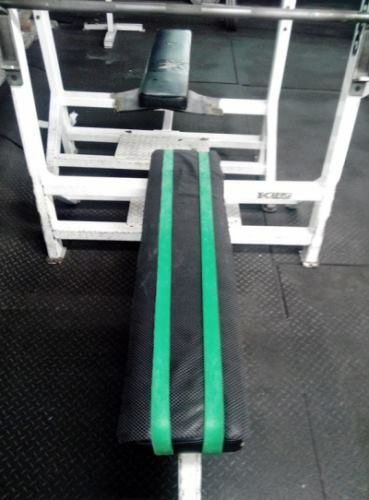 Do you want to spend as little money as possible on a solution for preventing sliding and slipping during bench and squat? Then you should try using a shelf liner and chalk as mentioned above. That said, you can get this muscle tee for around $30. That's pretty damn cheap considering the utility you get from this thing. Many gymwear companies charge that amount or more for a regular old shirt without any added functionality. Are you a female? If you are, then I've got good news. 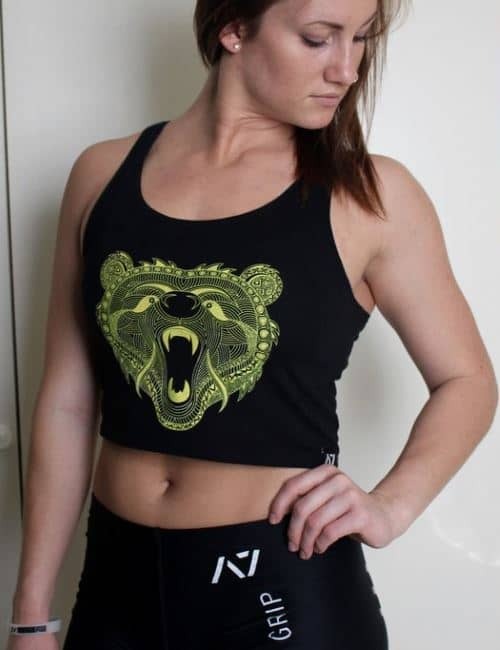 There is a women's version of the Bar Grip "Gnarly Bear" muscle tee. In fact, A7 makes women's versions for most of their designs. Obviously, my review is for the men's version. But you can rest assured that everything I discuss on this page applies to the women's, with two exceptions: First, the women's is a crop top cut/fit. Second, the sizing﻿﻿﻿﻿﻿ for females is relative to women's shirt size shirt sizing (i.e. choose XS-S if you usually wear size 0-6, choose M-L if you usually wear size 6-10). Whereas, men's sizing is based on an actual chest measurement. Read ﻿﻿﻿﻿﻿﻿﻿more ﻿﻿﻿﻿﻿﻿﻿﻿about sizing ﻿﻿below. Do you workout in a warmer environment? Whether it's hot where you live, your gym has no air conditioning or you just sweat bullets no matter the temperature, then this Bar Grip muscle tee (as opposed to the Bar Grip t-shirts) should be your top choice. It'll keep you cooler than the t-shirts mainly because muscle tees are, by definition, sleeveless shirts. However, as I'll discuss later, there are other aspects of the A7 muscle tees that make them better for staying cooler. Do you know the difference between a muscle tee and a tank top? I didn't know about this until I looked into it, but muscle tees and tank tops are not the same thing. Muscle tees are basically sleeveless t-shirts. Tank tops are sleeveless, too, but the arm openings are larger than on muscle tees. Also, muscle tees typically have the same crew neck as a regular t-shirt would. Whereas, tank tops have a larger opening that exposes some of the upper chest and the upper traps. If you're looking for a tank top instead of a muscle tee, then you're in luck, because they do make A7 Bar Grip tank tops, too (see this, this and this). Are you afraid of bears? Or maybe you just don't like this design. That's okay. There other ﻿﻿tank tops (sorry, no muscle t's available as of now--4/24/17) with the A7 logo on the front, which you may prefer. Below, I've compiled a list of the pros and cons of the A7 Bar Grip muscle tee. NOTE: I'll go into even more detail on some of these points later on in this article. ​Unmatched "Grippiness." The grips on this muscle tee, or any other A7 Bar Grip shirt for that matter, are made of the best material I've encountered for the application of improved grip/traction on bench and squat. Specifically, the grips provide maximum traction while still being suitable for use on clothing. How strong are the grips, exactly? 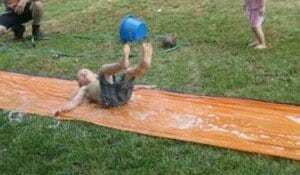 Well, just know that you (or the bar) will not slip, slide or shift, even if you and your shirt are soaked in sweat. Durable. This muscle tee is made to last, from the fabric itself, to the grips on the back and the design on the front. 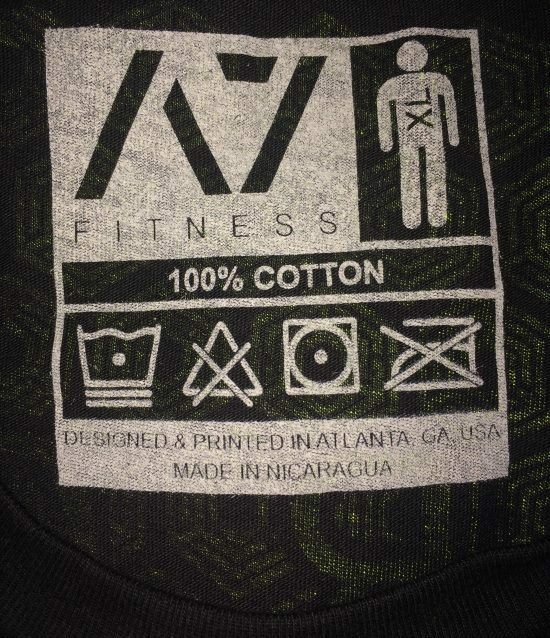 As long as you wash it as instructed, you can expect this shirt to be right there with you--taking abuse for many, many intense squat and bench sessions to come. Breathable. This muscle tee is made from 100% cotton. One of the biggest benefits of pure cotton fabric is its superior breathability. This means air can circulate easily through your shirt, which you'll appreciate when you're in the middle of a balls-to-the-walls workout. Holds Less Odor. Unlike shirts with synthetic fibers, cotton shirts like the Bar Grip muslce tee do not have a tendency to develop a funky scent over the long-term. So you can expect this shirt to smell as fresh on the 30th wear as it did on day one. Accentuates the V-Taper Look. This muscle tee, like all A7 Bar Grip shirts, has an athletic fit. This means that it has a slight taper: wider at the top and narrower toward the bottom. This is also true for the women's version of the Gnarly Bear muscle tee, which I touched upon in the previous section. However, since women's muscle tee is also a crop top, the taper ends on the torso just above the belly button, which is wear the shirt itself ends. As an aside, the women's Bar Grip t-shirts also have an athletic fit, but since they're full length t-shirts, they taper from wider at the top to narrowest in the midsection and then they get wider at the bottom--like an hourglass shape, obviously to accentuate the natural curves of a fit woman. Comfy - Can't Feel Grips Through Shirt. Despite having silicone grips adhered to/printed on the back of the shirt, it doesn't feel like there's anything there when you're wearing it. No rubbery texture or other sensation on your skin--just the soft feel of the shirts cotton fabric. May stretch temporarily in short-term. Unlike most synthetic fabrics, cotton does not wick. As such, it may become clingy as it gets soaked from sweat. This tendency to retain moisture also makes it more likely to temporarily stretch in a specific area of the shirt if pulled on during moderate-heavy use (e.g. around the waist when wear a tight weight lifting ﻿﻿﻿﻿﻿belt). It will return to it's original shape as it dries and the cotton fibers shorten from there elongated state. May get slightly looser in long-term. Although the shirt will rebound back to it's normal shape in the short-term (as explained above), it may get slightly looser after several wears. This could occur by you noticing that it's a bit less snug than when you first wore it. Or, it may hang slightly lower than originally. This is par f﻿﻿or the course for any 100% cotton clothing. Related: The shirt will actually shrink﻿﻿ if you accidentally wash or dry it with heat. However, if you know how to do your own laundry, should already know this; plus, as I'll discuss later, there are other reasons for not washing/drying with heat. For these reasons, I'm not giving this fact it's own "con" bullet point. But I wanted to mention it here in case there are any Mama's boys out there who don't know how to do their own laundry--and I don't want them to shrink their by accident. You may have to modify your set up slightly. If you get into your bench setup by dragging your shoulders/upper back against the bench, then you may get some bunching due to the friction of the grips. If this happens and is an issue, you'll have to modify your set up--I personally just lower my shoulders/upper back into the proper position, rather than dragging them. Similarly, if you drag the bar against your traps when getting under the bar to squat, you may also encounter some bunching from friction. The solution is the same: Get better at placing the bar on the correct part of your traps from the start. If you're used to dragging, then it may take a couple of squat workouts to get good at landing your traps under the bar at the perfect spot. And even if you don't get it exactly where you want it, you can very easily wiggle around a bit before liftoff to make small adjustments as needed without causing bunching. The patent pending silicone grips on the back of the shirt are, of course, what make this muscle tee more than just gym clothing. These silicone grips are designed specifically to resist movement against surfaces, even if they're damp. The grips are placed on wide area covering the upper part of the back of shirt, from shoulder to shoulder shoulder, and from traps to mid-back. The grips are surprisingly strong and durable. They are much "grippier" than the shelf liner material I mentioned earlier. I've been particularly impressed by just how grippy they are, especially considering that there is quite a thin layer of the silicone material. The A7 muscle tee shirt is made of 100% cotton. This is different than my A7 t-shirt, which is made from a blend of 60% cotton and 40% polyester. Synthetic fabric has many positive characteristics. However, its major drawback is that it retains odor over time. It's not noticeable at first. But after after many uses during intense workouts, the shirt will eventually have a faint stale scent to it--even after washing. This is because the synthetic fibers trap the oil/fatty secretions found in sweat. Normal washing can only remove so much of this oil, leading to a buildup over time. The oil, itself, causes some of the odor. But the real issue is that the trapped secretions attract and support certain bacteria, which contribute the most to the funky smell. This is where​ cotton saves the day! Shirts like the A7 muscle tee that are made from 100% cotton (or other natural fibers) trap very little oil from sweat--So little that odor retention is not an issue, assuming you wash your shirt after your workouts (and if you don't, please don't bring your B.O. to my gym!). Cotton is more breathable than synthetic fabrics, which promotes better air circulation to keep you cooler. ...So, if you're having an intense workout, the muscle tee lets you use your sweat to your advantage. The tee will hold onto more moisture for longer. As it dampens, it'll drape on your torso and directly contribute to keeping your skin and body cooler. Of course, the property of moisture retention also makes the shirt more susceptible to being stretched out when damp and force is applied to the fabric. Don't worry, though! This is just a temporary effect. The muscle tee will return to it's normal shape. It'll just take longer than compared to synthetic fabric. And unless you really stretch this muscle tee to the point of permanent deformation, then it will maintain its shape in the long-term. The sleeveless design of this muscle shirt is great for keeping cool during warmer months and in warmer climates. It will also help keep you cool while you work up a sweat during your most grueling workouts. No sleeves make it great for showing off your guns on arm day. If you follow the above guidelines, you will maximize the longevity of the shirt and the silicone grips. The cut of this muscle tee shirt is designed to be form fitting without being too tight. The "athletic fit" refers to the shirt being "tapered." Tapered means that it's wider at shoulders and upper back, and gets narrower toward the waist. It is a muscle tee shirt, so it features armholes that are the same width as they would be if you took a regular t-shirt and cut the sleeves off at seams. This cut, plus the tapered/athletic fit is a winning combo for showing for showing off and accentuating your physique--but without sacrificing functionality. First off, it's important to note that although this is an athletic fit, it's meant to fit a bit looser than the Bar Grip t-shirt of the same size. I would say that ​the A7 muscle tee fits true-to-size compared to most other brands' athletic fit shirts. Whereas, I would consider the Bar Grip t-shirt to run maybe a half size small. This means that if you were on border between a medium and a large, it'd be wise to get the large. If you're interested in the t-shirt, here's the sizing chart for your reference (just keep in mind what I said about the sizing running a bit small). 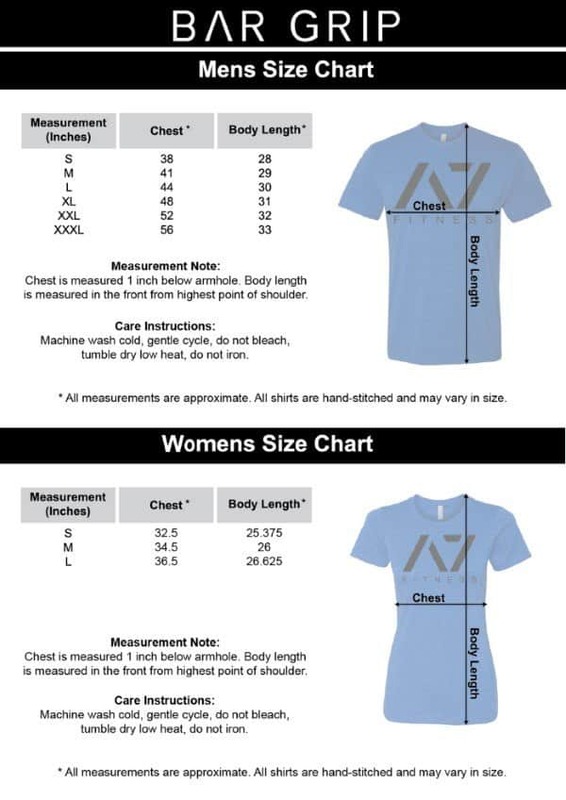 ...However, if you're not sure or if you don't always get the same size, then you should reference the sizing chart below and measure your chest as described with a tape measure​ (or use a string, then measure with a ruler). Hell, I'd recommend you do this anyway, just to be doubly sure you're getting the right size. Since this is a true to size muscle tee, the sizing chart is accurate. However, let's say your chest measurement is 41.5 inches--smack dab between a medium and a large. In this case, you would be fine with either the Medium or the Large in terms of function. Just pick the medium if you prefer a snug fit (or if you'll be cutting down) or a large if you prefer the fabric to somewhat "drape" over your physique to provide more breathability (or if you'll be bulking up). The muscle tee features a ferociously adorable bear that covers the chest. 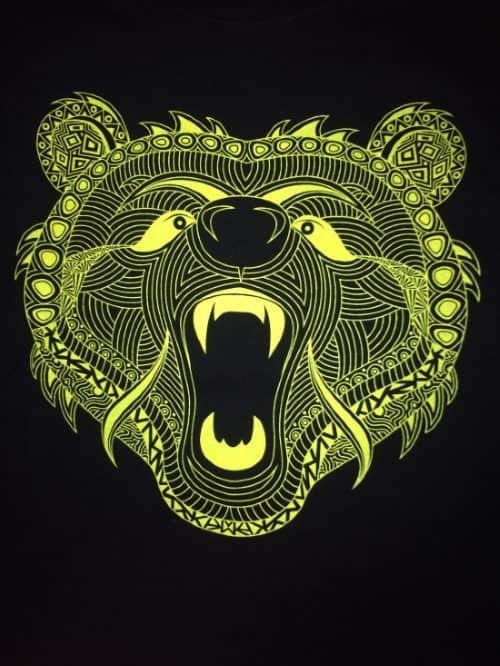 This "Gnarly Bear" symbolizes humbleness and strength: two traits that any lifter should strive to embody when dealing with heavy weights the gym. It is in bright neon yellow, which really pops on the black backround. The back of the tee shirt features rows of hexagons with the A7 logo proudly displayed. These hexagons are made of the patent pending silicone Bar Grip material described above. On top of other regular guys like myself, tons of non-competitive/recreational lifters and many amateur competitors, there are some well known names in powerlifting that rock these awesome shirts. As you'll see below, guys like Josh Hancott, Bryce Lewis, Brett Gibbs and Brandon Campbell can all be seen sporting A7 Bar Grip apparel. 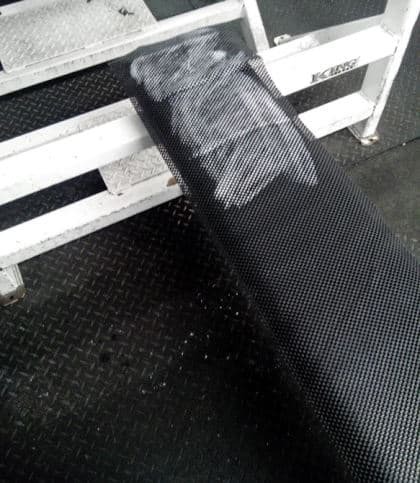 Are you tired of back slippage and bar sliding during bench and squats? Do you want a better, simpler and cleaner solution than chalk and shelf liners? 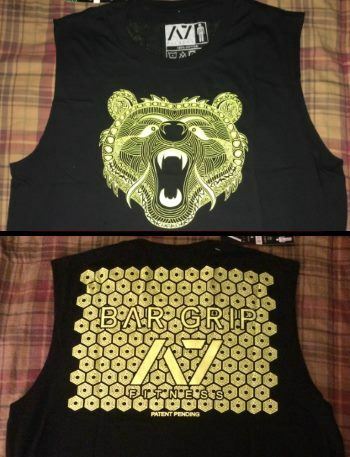 If so, you should definitely consider ordering yourself an A7 Bar Grip Gnarly Bear Muscle Tee today. If you can relate to the above-described issues with bench and squat, then I know you'll love it. And at around $30, it's not an expensive decision to make. 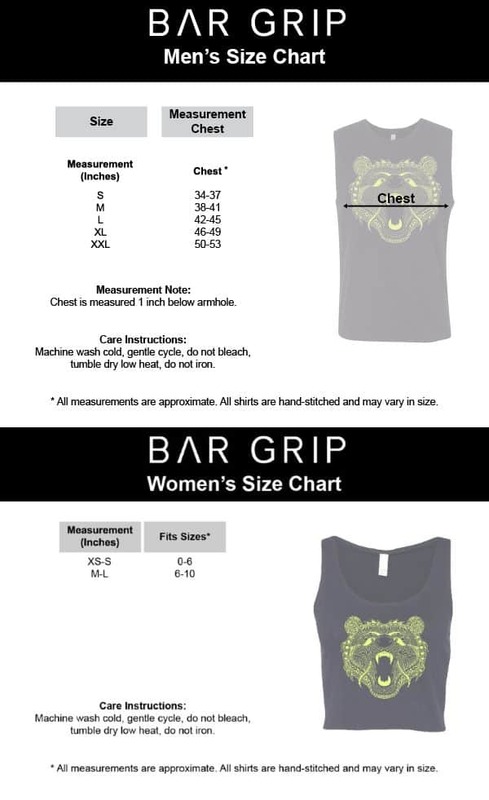 Men's & Women's Bar Grip "Gnarly Bear" Muscle Tee -- UPDATE: Sorry! This design is no longer available. However, there may (or may not) be new muscle tees available now. Check muscle tee availability here for men and here for women.